Settle into the holiday season at the coziest restaurants in L.A.
Worldwide icon-chevron-right North America icon-chevron-right United States icon-chevron-right California icon-chevron-right Los Angeles icon-chevron-right Settle into the holiday season at the coziest restaurants in L.A.
With rain on the way, Christmas fast approaching and plenty of holiday parties to attend to, sometimes we just want to put on our comfiest outfits and go out to eat somewhere cozy. We're talking fireplaces, charming cottages and restaurants that feel like you're eating at your relative's house—minus the tense political discussion. Here are some of our favorite cozy restaurants in L.A. where you can kick back and relax, just in time to de-stress from the holidays. Jones (West Hollywood): This dark, West Hollywood institution is filled with nooks and crannies where you can post up for the night alongside giant plates of pasta and glasses of wine. The booths are comfortable and spacious—unless you snag one of the two-person booths in the corner, where you can cozy up to your significant other while sharing spaghetti, Lady and the Tramp-style. 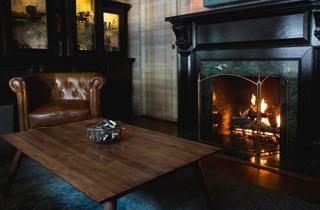 Bowery Bungalow (Silver Lake): Dining at Bowery Bungalow is like being at a friend's dinner party. The charming cottage exudes warmth and comfort, as do the Mediterranean dishes that come out of the kitchen: big bowls of couscous royale, turmeric fried rice and market fatoush. The backyard patio is perfect for enjoying brunch under twinkling lights. The Old Place (Agoura Hills): Stepping into the Old Place is like entering a portal into another century. The rustic cabin feels part-Western, part-Colonial, and serves some serious comfort food enjoyed at small booths or a communal bar. Next door, the adjacent Cornell Winery is a tasting room that celebrates wines sourced from L.A. to Monterey. Grab a glass and settle into Adirondack chairs scattered outside. Pace (Laurel Canyon): Getting to Pace might be a bit of a challenge—the restaurant is located on one side of busy Laurel Canyon Boulevard, and valet can be a drag—but once you're inside the Italian trattoria, relief washes over you in the form of warm service, a cozy atmosphere and heaping plates of lasagna. 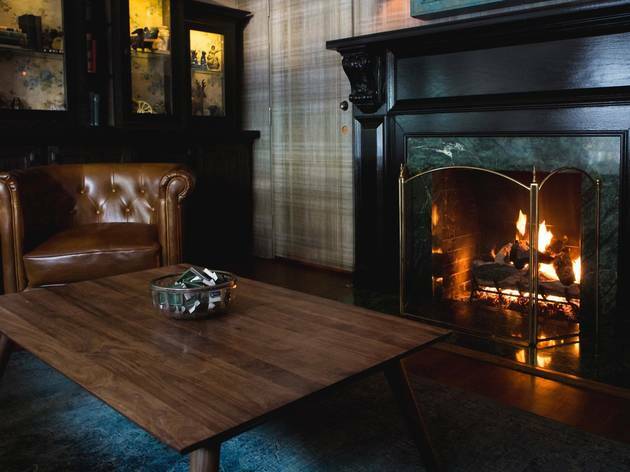 Magnolia House (Pasadena): This century-old Craftsman bungalow is both a cocktail bar and a lounge, and a homey place where you can dine on small bites and sip cocktails by the fireplace. Deep-set chairs and bookshelves filled with knickknacks give the space a relatable touch—plus, their Moroccan lamb meatballs are bomb. Clifton's Republic (Downtown): Clifton's, which recently changed it's name from Clifton's Cafeteria to Clifton's Republic, is cozy in the sort of way a leisurely Disneyland ride is cozy. Curiosities fill the space—like a giant tree that juts up through the center of the building—but so do comfortable chairs, a fireplace and dim lighting. The Raymond (Pasadena): At this charming Pasadena restaurant—a former caretaker's cottage from the famed Raymond Hotel—diners tuck into comfort classics like Jidori chicken, roasted duck and steamed mussels. The heated outdoor patio is cozy even on chilly nights, and the attached bar, 1886, serves some of the finest cocktails in L.A.
Dominique's Kitchen (Redondo Beach): Chef Dominique Theval is cooking some seriously good food at his namesake restaurant, Dominique's Kitchen, where South Bay denizens come to dine on classic French cuisine in a charming setting. The restaurant is located in an old house and boasts comfy couches that make you feel like you're in your own living room.